Six cylinder two wheel drive automatic 65,000 miles. My car has been pulling an OBD code for the Bank 1 Sensor 1 oxygen sensor, but I cannot find it. I can only seem to find one before the catalytic converter and one after, so am I overlooking one or are there only two? If there are only two, why would the same code continue to flash if the two sensors were replaced? Please help. The code it is pulling is P0135. I have replaced the one before the catalytic converter, but the problem persisted which led me to believe there is another which I found and fixed thanks so much I will get back to you if I have another problem. I love this site. Trying to find the location of the O2 sensors. Found one on the rear of the engine, but cannot locate the second sensor. Heated Oxygen Sensor (HO2S) Sensor 1 (3.4L VIN E)In exhaust manifold, rear of engine compartment. See Fig. 36. Heated Oxygen Sensor (HO2S) Sensor 1 (3.8L VIN K & VIN 1)Above exhaust manifold. See Fig. 56. Heated Oxygen Sensor (HO2S) Sensor 2 (3.4L VIN E)In exhaust system, behind catalytic converter. See Fig. 45. Heated Oxygen Sensor (HO2S) 1 (3.8L VIN 1)In exhaust manifold, rear of engine compartment. See Fig. 31. Heated Oxygen Sensor No. 2 (3.8L VIN K)In exhaust system, behind catalytic converter. I am trying to change my front o2 sensor by myself, so I was wondering what is the best way to locate it? Can I reach it from the top of the engine or should I look from the bottom? 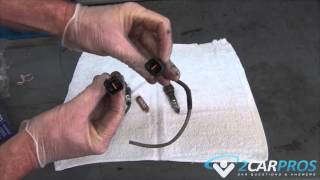 Could you tell me the location of the oxygen sensor that needs to be replaced? You have four could you provide code in P0xxx format. 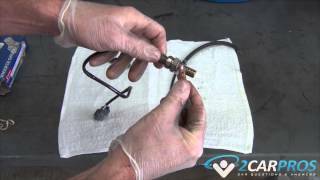 Where is the o2 sensor located and how do you replace it? Located in the exhaust pipe. One in front of the catalytic converter, and one behind the converter. Unplug the sensor and use a 7/8 wrench or O2 sensor socket to remove the sensor. Got a flag on the O2 sensor. P0140: O2 sensor circuit no activity detected (Bank1 Sensor 2). Under the car back by the catalytic converter. Where is the O2 sensor located on my car with a 3800 in it? I believe there are more than one. Check on the exhaust manifolds, the down pipe from the manifold, and both before and after the catylatic converter. It is in exhaust manifold rear of the engine compartment. 2002 Chevy Impala Advice Needed Desperately!! !